Mary Ellen Barbera was appointed chief judge of the Maryland Court of Appeals in 2013, making her the first woman to lead the state’s highest appeals court. It also marked at highlight of her career. “The responsibility of the position was immediate and awesome, for with it has come the opportunity to move the Judiciary forward in keeping the promise of equal justice for all in Maryland,” she says. Barbera was born in Baltimore and later attended Towson State College, now Towson University, where she earned a bachelor’s degree in early childhood education. She worked as a teacher in the Baltimore Public School System for nine years, attended law school at the University of Maryland at night and earned her law degree in 1984. 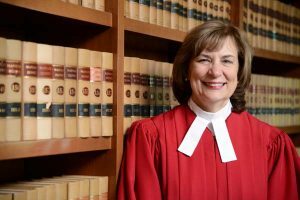 The next year, she became an assistant attorney general, working her way up to the role of deputy chief of the Criminal Appeals Division of the Office of the Attorney General from 1989 to 1998, according to the Court of Appeals website. She’s served on the Maryland Court of Special Appeals, as a member and chair of the Criminal Law and Procedure Committee and as a Judicial Ethics Committee member of the Maryland Judicial Conference. She was legal counsel to the Office of Governor from 1999 to 2002 and a member of the Task Force to Examine Crime Victims’ Rights Laws in Maryland. “The people of Maryland inspire me and I am proud to be able to serve them to the utmost of my abilities,” Barbera says.